I was part of a two week summer camp here in China for local youth (ages 12-19), teaching English and arts. 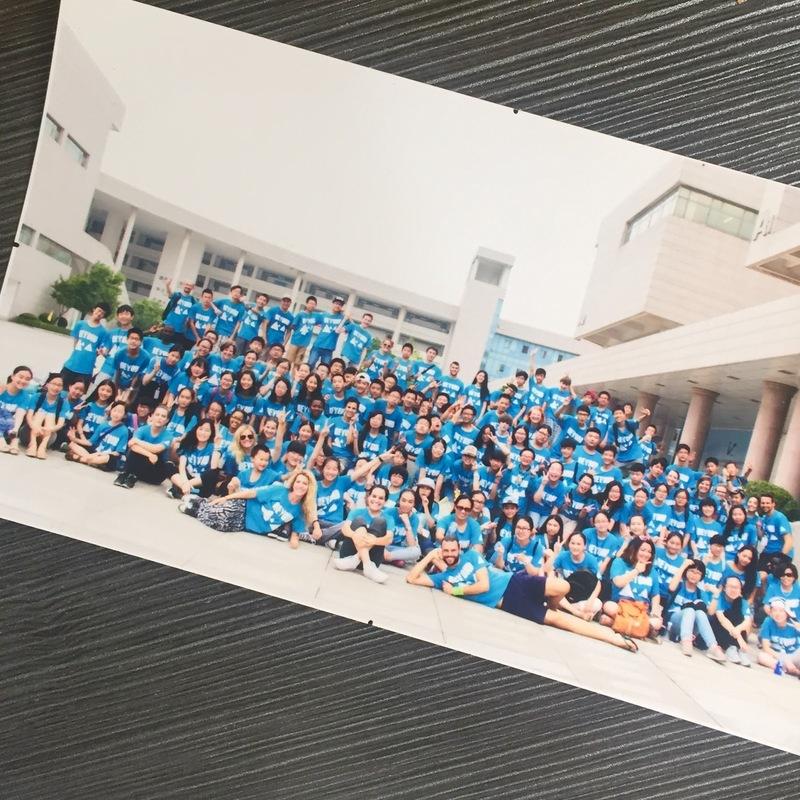 A team of people from Los Angeles came to join up and help run the camp, along with some expats in and around the greater Shanghai area, as well as many local Chinese. I was willing to help out however I was needed, and the camp directors slotted me to teach English. I also partnered with one of the L.A. team members, an old friend and mentor, to teach the Visual Arts class. My Visual Arts classroom, at the end of the day. I'm not a trained visual artist by any means, my education is in live theater. But I am an artist because I do make art as often as I can. I have previously taught art (and have even been paid handsomely to do so as recently as May). I run a weekly creative group call the Playground out of my house, so if you asked me what I'm good at, I'd probably list "helping people express themselves creatively through art" somewhere near the top of my list. So that part of the camp was excellent, and working with my friend and some incredibly talented and dedicated teen artists was amazing. And then there was the English teaching. I am not risk adverse. I tend to play it safe with food (one too many episodes of food poisoning in the land of squatty potties and a shellfish allergy keep me cautious) and with physical activity (though I did zip-line through the jungle canopy in Thailand for 4+ hours), but with many other areas in life I'm all for stepping out and doing something brand new that has a great potential for failure. I'm mildly comfortable with failure, in fact, and have been known to be pretty excited when something has blown up in my face, especially when it doesn't affect too many other people. Failure means you tried something new! How can that be bad? I just read a quote today by T.S. Eliot, "Only those who will risk going too far can possibly find out how far one can go." And I think that kind of sums up the English teaching for me. Maybe even my whole life. I've never taught English, and certainly not to people who don't speak much of it, if any. But not having done something before is never what I use to gauge whether or not I should say yes to something new. There were five levels of English being taught, and I was responsible for the ones who had the lowest fluency. In years past at this camp, there were just 6-7 students at that level. I ended up with 19, most all of them teenage boys. I had a strong translator and we made a great team (every day I taught her a new idiom in the English language, and that was actually super fun), another bilingual helper, and two helpers from the L.A. team. Sounds like it should be easy, right? Basically 4 students per adult? Somehow it didn't turn out so easy for me. The curriculum was being written and distributed in real time, and almost every day I'd get it less than hour before class started. I can be good at winging it (the first idiom I taught my translator), but this is not the way I work best or most comfortably, and certainly not a way that can be sustained with any success for me beyond once or twice. The experienced ESL teachers had years of teaching ESL to fall back on. I had physical comedy and enthusiasm, and even that quickly wore thin. My ESL class in the calm before the chaos. I limped through the first week with the help of the extremely encouraging helpers, but there came a day in the second week where my helpers missed class for a rehearsal of dance choreography for the evening's assembly and I was on my own. One of my students crumpled up and destroyed someone else's work, causing crazy chaos. As soon as that was settled and it was quiet, another student chucked his pencil right at someone else's head. It was that day, when I was trying to hold back tears of frustration and thinking that I wasn't getting anywhere, that I realized I had truly come to the end of myself and that I don't enjoy teaching ESL, nor do I have any desire to use what strengths I do possess to do it. I don't think this sudden epiphany had everything to do with the naughty behavior of a few students (though that did contribute), it was more about realizing that I'm absolutely best at helping people pull out stories or emotion to create something beautiful rather than to teach vocabulary and literal communication using spoken words in a classroom setting. Maybe that's the mark of a bad teacher, because I never had any frustration in the Visual Arts class despite the fact that a third of my ESL students (including one of the ones with the naughty behavior) were in my Art class. Shouldn't a good teacher be able to teach anything? I don't know. I have no idea in the end if their grasp of the English language was increased on the last day from where it was on the first day. But they did learn to work as a team much better by the end of the two weeks than they did on the first day, so I count that as success. And frankly, even the fact that I can sit here after it's all over and say that I discovered teaching English is not for me is something I can count as a success. After all, how in the world do we know what we are capable of if we don't go out and try? And I'm happy to report that there was at least one student in my class who thought my English teaching skills rocked.